Renewing your mind is the true life story of one man’s search for physical, emotional & spiritual peace. He now helps people to achieve new levels of success, overcome their stresses, hidden fears & worries. Author Anthony M. Davis shares his experiences after watching countless people’s lives transform to new levels of happy & confident living. 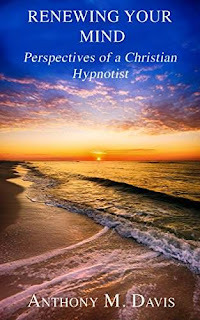 Within this unique, written journey, you will gain a new understanding of hypnosis as a natural, healthy restorative process & how it aligns with Christianity to renew your mind. You Too Can Live a Life of Reward. This book is a “One-of-a-kind” journey, describing what hypnosis is, and what it is not. There are literally NO OTHER books like this on the market anywhere. If You’re Unsure About Hypnosis Then You Really Should Buy This Book. So many misperceptions are floating around based upon false beliefs. Knowing the truth about hypnosis can help you neutralize the emotional baggage that you might have carried. This is the difference between living and wondering what a happy, healthy life would look like. There was a time when Anthony M. Davis didn’t even believe in Hypnosis. He served in two military services and law enforcement. He focused his life on serving and finding facts. His earlier book was a bestselling Terrorism book. Then, amidst an unsettling environment he found himself on a new path he never expected. He is now a leading practitioner in the U.S. and clients travel in from all over the country for his help. He now helps abuse victims renew their lives from fear, stress, shame, guilt and worry in just a few short sessions. If you’re in a place in your life where you’re looking for change, his story might resonate with you. 1. You and I live in a stressed-out world and too many people have lived on drugs or “talk-therapy” for years only to be more stressed than when they started. It’s possible that you’ll find people in this book that are similar to you. 2. Do you know what hypnosis is and what it is not? This is not a science book – This is intended to be a true to life conversation with you, to help you find safe and healthy self-help processes to strengthen your life. 3. Do you know that you enter a light state of hypnosis every day of your life? Who ever said, “No, I don’t want the facts”? Be Good to Yourself and Get This Truth-Filled Book Today.